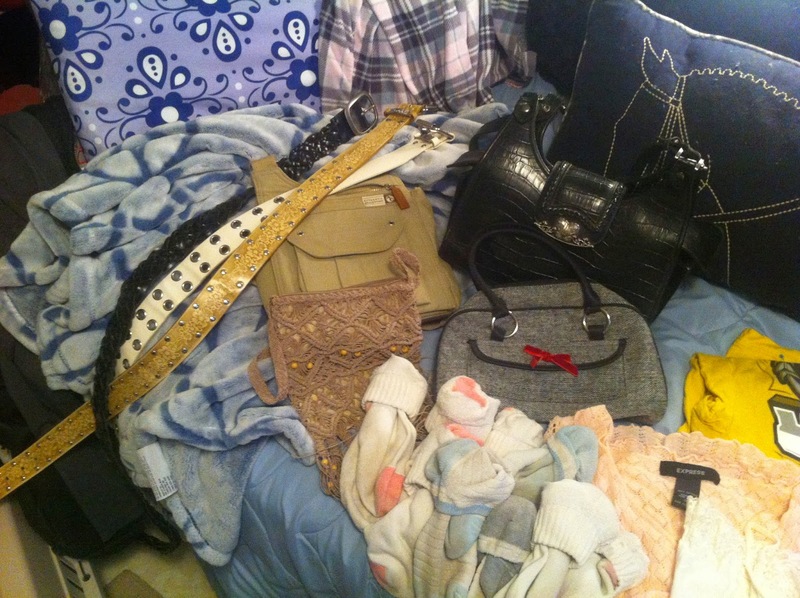 Since late summer or early fall, I've been collecting in a bag in my closet clothing items to get rid of. On New Year's Eve Day, I finally went through these items. I only returned two to my closet (a purse and a tank top), and the rest got photographed, cataloged, and sent to Goodwill. Although this was actually the very last day of the previous year, and although the donation included the belts and purses I set aside to get rid of last year, I'm counting it as Day 1 of the new year and my new project. Doesn't let me off the hook for this year, though. Of course, everything went to Goodwill. Goodwill is a quick and easy one to donate to, but in 2015 I may switch to another charity: a thrift store that raises money for dog spay/neuter and rehoming. Since it's a new charity, I want to do some research first and make sure everything looks legit. I have a small closet in my new place, so going through clothes may be something I do on a regular basis, especially after buying anything new. Only so much can fit in my closet, and I already have it pretty well filled! One trick I've heard is to turn the hangers backward with everything you own, and as you wear things, turn the hangers back around the correct way. Then, at the end of the year, you'll be able to identify at a glance everything you haven't worn during the past year, and that's the stuff you should get rid of. I've done that with a few of my clothes that I don't wear very often, but I'm thinking about doing it with everything. I'm planning on going through my clothes again sometime today, since most of what I gave to Goodwill had been in that bag for weeks or months -- I haven't actually gone through my whole closet in some time. So Day 2's contribution should be some more clothes. I'm looking forward to a year of simplifying!